Solar Cell and Energy Related Products | 友士股份有限公司-USE Electronics Co., Ltd.
We are producing the world’s top class cells with excellent production processes and high yield rates made possible by continuous innovations. Cells produced by automated systems are available as products made with mono-crystals and poly-crystals and are also available as 2BB and 3BB types. These modules have track records, including numerous international certifications. Highly efficient solar cells that offer stable and high energy outputs, as well as modules created with cutting edge manufacturing technologies and reliability that have long-term life spans are ideal selections that provide high efficiency and cost effectiveness. We thoroughly pursued high precision wind-up and foreign matter counter-measures and miniaturized skew correction units and achieved high precision wind-up by positioning a skew correction unit immediately in front of the wind-up component. Foreign matter counter-measures that are particular even down to individual small components. Segment brush units with longer lengths as well as the adjustment functions for cut depth and trim length of brushes were adopted to deliver precision edge finishers with significantly improved stability and consistent finishes. Leaks of electrolytes coming out of micro-pores and cracks in lithium ion batteries are reliably detected and leakage inspections that had been performed visually in the past are now possible to be done digitally. Detections are possible for leaks the size of a pinhole measuring 5 μm in diameter. 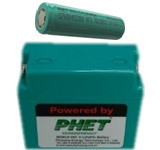 Inspections can be performed on small consumer models to larger car mounted batteries.